Take a look at this girl's fiber stats! Vindaloo has extremely consistent crimp and character throughout her entire blanket including her top knot and belly. The style is super high frequency with a handle you'd be lucky to find in a white let alone a gray animal. The Hemingway traits run strong and deep with this incredible girl. 2013: AFD 23.0; SD 3.9; CV 17.1; Comfort Factor 96.5%; Spin Fineness 21.7!! All of this at 6 years of age!! 2014 : Afd 22.2; SD 3.7 ; CV 16.5 ; Comfort Factor 98.1 %; Spin Fineness 20.8 !! Getting better with age! 2015 : Afd 21.9; SD 3.3; CV 15.2; Comfort Factor 97.9%; Spin Fineness 20.3 at 8 years of age!! Breedings are being reserved now. A phone call and a small deposit will hold your booking! With stats like Vinny's it is easy to see how you can upgrade your grey breeding program today. Vinny is technically a Light Rose Grey as he has the Rose Grey down his neck, the cap on his head and brown and black fibers running all throughout his blanket. This makes Vinny a "stealth" Grey. To cover Grey and have the fineness, bundles and elite fleece is a rare find and just what Vinny offers. 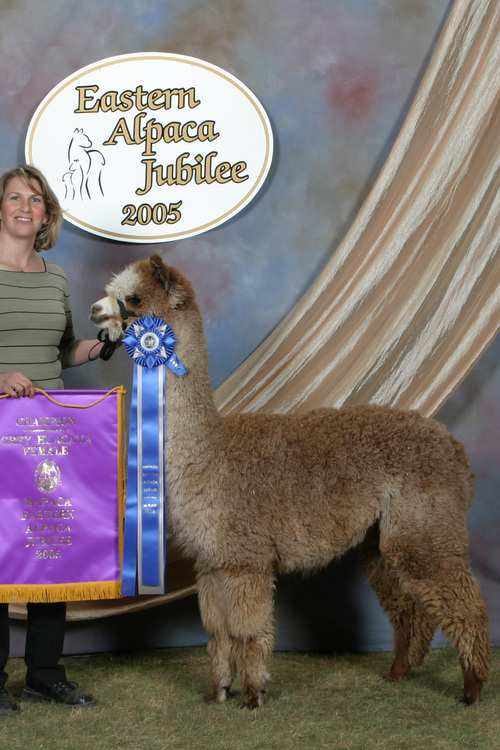 Vinny's Dam is none other than the MAPACA Grey Color Champion - Vindaloo! 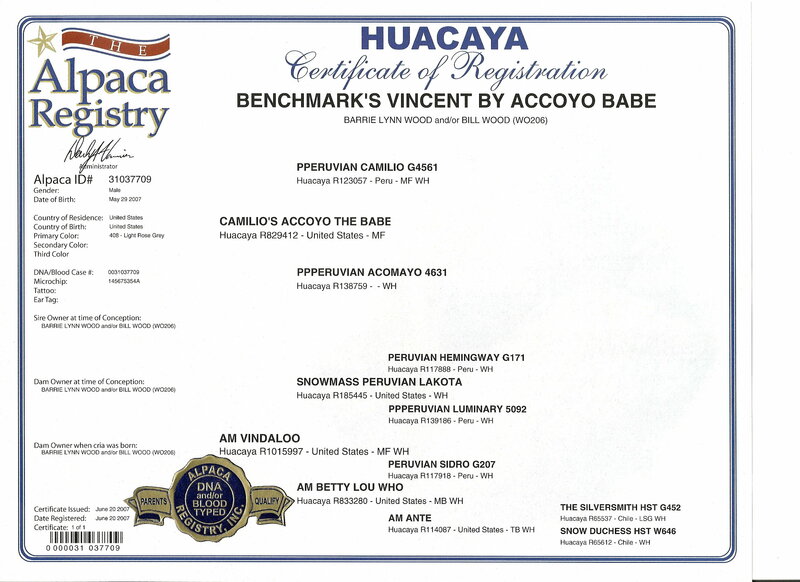 Her rich Rose Grey color and super fine fleece has complimented Accoyo The Babe well and helped to produce a high quality Herd Sire in Vinny. Vinny has been shown in Indefinite Light - meaning he is a light animal with dark fibers running through - when he was a Juvi and as a Yearling, he has shown in Beige. The judge could not say enough about him in the Beige class and actually complimented him more than any of his competition. She loved his balanced frame, large bone, coverage, typey head, high frequency crimp and tiny bundles. She explained to all that the reason he was standing in 5th (out of 15 animals at a level V show) was due to the dark fibers running throughout his fleece. 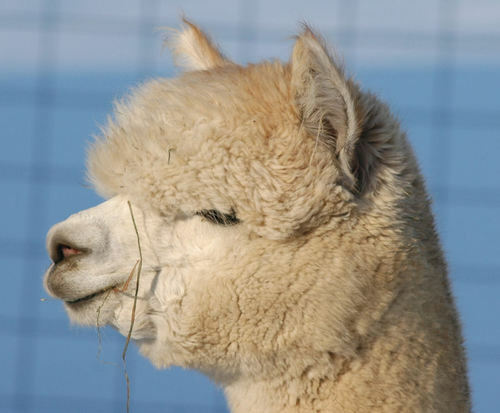 The judge at Oaba Alpacafest commented on Vinny's "Substantial presence and Superb head style". 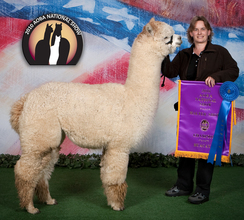 She stated that he is a very "Robust male" and exhibits "Very soft handling and consistent fleece". Vinny has limited offspring on the ground but check out the results below. He is definitely passing on those fine fleece traits!! 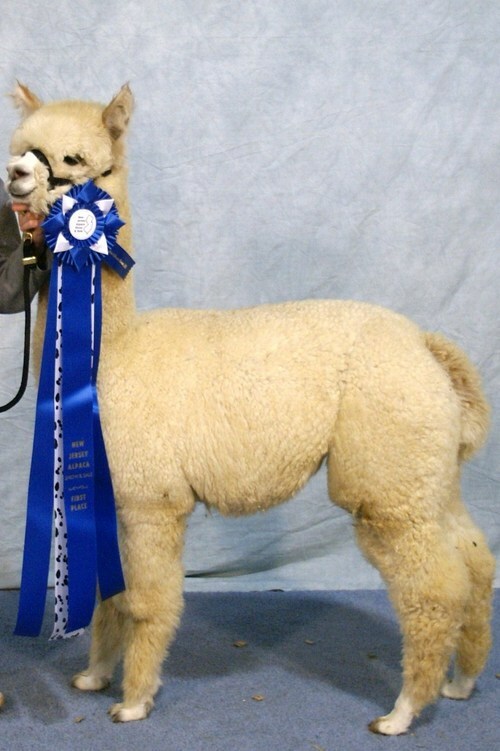 Vinny is co-owned with Benchmark Alpacas. COLOR CHAMPION AOBA NATIONALS 2010 - at 3 years old!! Halter - Beige Class! - Empire Extravaganza - Level V 15 animals in the class! auction breedings prices are for drive by breedings only. Please contact us for special on farm breeding fees. Heavy, slick, buttery, fine fleece! Gorgeous white fiber! See Histogram!